An arthritis drug removed over safety concerns last year could have been linked to thousands of heart problems, and even deaths, researchers estimate. The Food and Drug Administration study in the Lancet said Vioxx could have caused up to 140,000 cases of coronary heart disease in the US since 1999. But makers Merck said there were many risk factors and the data did not show the drug was to blame. Around 400,000 UK patients were prescribed the drug. Over 106.7m prescriptions were given to patients in the US. 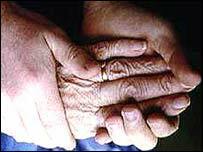 However, the UK's Arthritis Research Campaign called the latest Lancet study results "shocking". Vioxx, (rofecoxib) was removed from the market by Merck in September last year after research found an increased risk of heart attack and stroke. The drug belongs to a class of drugs called Cox-2 inhibitors which are non-steroidal anti-inflammatory drugs (NSAIDs). The FDA study analysed data from 1.4m people in California who had used Vioxx, another Cox-2 called celecoxib (Celebrex) or other NSAIDs between 1999 and September last year. The researchers found 40,000 had used celecoxib, just under a million had used ibuprofen, 435,000 naproxen and 27,000 Vioxx. They found that 8,143 had serious heart disease, 1,508 of whom had sudden cardiac death. When the researchers examined the risk of heart problems linked to each drug, they found people taking Vioxx had a 34% higher chance of coronary heart disease when compared to people taking other NSAIDs. Coronary heart disease was 1.6 times higher among people taking standard dose Vioxx compared to those taking celecoxib and 3.6 times more likely among those taking a higher dose. Writing in the Lancet, the lead researcher Dr David Graham, from the FDA's Office of Drug Safety, said: "While this report was in preparation, rofecoxib (Vioxx) was withdrawn from the market by the manufacturer. "We should assess the potential public health effects of failure to take earlier action. "In the future, when trials show that a new treatment confers a greater risk of a serious adverse effect than a standard treatment, we must be much more careful about allowing its unrestrained use." Professor David Webb of the University of Edinburgh's Clinical Pharmacology Unit, told the BBC News website: "One of the important things is that we might have known about this at an earlier stage. "It now falls to the manufacturers, under the careful review of the regulatory authorities, to provide all the evidence that this class of drug is safe, if necessary including studies that directly address cardiovascular morbidity as a primary outcome." The study also found that people taking naproxen had a 14% increased risk of heart disease compared to those taking other painkillers, contrary to previous research which had suggested it had a protective effect. However, Professor Webb said: "What this study shows is that NSAIDs don't have a protective effect. It was a relative result compared to drugs like Vioxx." Jane Tadman, of the Arthritis Research Campaign, said: "These findings in the Lancet are shocking. "Around 400,000 people were taking Vioxx in the UK at the time the drug was withdrawn, so it seems likely that many people with arthritis in this country will probably have suffered heart attacks too. "This data adds further weight to calls that Vioxx should have been withdrawn from sale several years earlier than September 2004." European safety regulators are currently investigating concerns other Cox-2s could also be linked to an increased heart attack and stroke risk. Ms Tadman said: "There still remains considerable doubt about the whole class of COX-2 drugs, with some doctors no longer prescribing them to patients while others continue to do so." The current advice says GPs can prescribe Cox-2s to arthritis patients who are not at risk of heart attack and stroke, but Ms Tadman said some at-risk patients were still being put on COX-2s. The UK's Medicines and Healthcare products Regulatory Agency will look at this new study as part of the ongoing review of Cox-2 inhibitors." Mo Atachia, spokesman for Arthritis Care, added: "This report paints a distressing picture. Thousands of people with arthritis find living with the condition difficult enough as it is. "The stress this kind of news brings is quite simply unbearable." He added: "It's essential that the European safety regulators deliver swift a verdict as possible on the whole class of Cox-2 treatments." Merck has always said it has acted responsibly and appropriately in the way it developed and marketed Vioxx. Responding to the predictions of heart disease risk in the Lancet the study, a spokeswoman told BBC News: "You can't do that with the extrapolation of the data. "There are many risk factors for heart disease and stroke. "To determine whether Vioxx was responsible for any, you would have to look at patients on a case by case basis."